This session addresses the question of "How can traditional churches and those with older congregations use new media without excluding people?" Now you may well be asking what is this New Media or Social Media as it is also known. It is Websites, Blogs, Mobile Applications, Video, Audio and Social Networks such as Facebook and Twitter! At the conference, we were given the opportunities to investigate how to do those 8 things, to a greater degree of skill! This session is about putting that knowledge into practise! To use New Media is to Tickle! Now instead of using our question each time I want to address, I have summed it up into one word - Tickle! Here is what Tickle stands for! So by the time this short series is over, hopefully we will have learnt a bit more about the art of Tickling and how to get people using it! However, before we know how to tickle, there are two questions to answer. Our first question is why. You may well be here and not know why you should be using new media and tickle! Why do we want to know how to use New Media and include everybody? The church of the New Testament had the 3 r's! There were seen as radical! There were seen to take risks as led by the Holy Spirit! There were seen to be relevant to their communities! How far from this has your church gone? It can shows church acting as a community! Gives the excluded and elderly an opportunity to know they are loved, valued and included. Gives those same people, the chance to use their talents and spiritual gifts! Further along those lines it gives them an opportunity to further enhance and be trained in the use of their talents and knowledge! But now a second question remains before we get to how. That question is: Who are we excluding - either deliberately or accidentally? So what about me? How have I used and encouraged others to use New Media? I think that everybody has some measure of talent that can be used, including those who would ordinarily be dismissed from having any input into Christian worship and thinking, such as the elderly and those we earlier identified as being from the excluded group! Now here is very brief example of this! That was the autistic daughter of a friend of mine, who has so far blessed hundreds of people! She is very precocious! That was a way to include somebody who sadly wouldn't normally be included in majority of church services, let alone New Media. In this case her voice was recorded, and we made a very simple video to go with it! The photographs were those of an elderly friend in Canada. So we managed to combine the both! So can you! Here are some other examples of people I have helped, who ordinarily wouldn't use New Media. R - retired lecturer who has written in-depth studies of the book of Luke for use in Home Groups. We are working at putting them online by way of audio and YouTube. Jim - retired - We were able to use his writings and put them online! He hadn't a clue how to do it before hand and now he is a regular contributor on my site. Pauline - has a degenerative illness. We had her do some podcasting and now she regularly gives bible talks in her church as a result! We have to use people's talents, knowledge and wisdom, whatever it maybe, and whoever they maybe, and put them online using New Media! We need to use those 8 methods: Websites, Blogs, Mobile Applications, Facebook, Twitter, Video and Audio. Make sure they are safe! Don't disclose too much personal information about them! Also ensure they get some measure of feedback, because that will encourage them to do more! Things that can be put on with New Media are photography, poetry, bible talks, testimonies, hobbies, interests and short stories. We could make an impact using New Media! Where I attend Church in the New Forest, the ladies there have amazing recipes which I am hoping to garner and put online - with photographic evidence and taste tests! Another way we can include those who wouldn't necessarily want to be involved in New Media! Another idea of how to include people in this new media is to get them to pray for people you tickle and interact with online! Facebook and Twitter are rife with prayer requests from people! Take those prayer requests and sensitively get members of your church to pray! Get them interested! What a great way to include them! Do ask however the person needing prayer if you can ask others though, as some people may not want you to! You don't need to give names or even initials! Somebody could get beside them regularly and help them - building community! For example, they could record several podcasts or videos at one time and then distributed over a long period of time. Or it could be once a month or whatever! Have regular monthly spots on your church blog so that on the 5th of each month, people know who will be on! For example, on the 5th of November Marjory shares a short poem she has written! This particular poem was recorded by George who can't get out much but has a fine strong voice still. Somebody has taken the time to be with these two people, has taken the poem written by Marjory, had it recorded by George on a smart phone and put it online! How about that for a bit of tickling? Another idea is New Media Days at your church, or churches together! You could hold a regular event, say quarterly, at your church where people can come and contribute something using New Media. For want of a better name call it a New Media Activity Day or something like that. It would be a good way to get the younger members of the church to interact with the slightly less young members of the church! Using New Media to build and encourage the church. The elderly, in particular, have a lot of knowledge and wisdom which can be distributed. The retired company chairman has invaluable advice she could give in regards to how the unemployed people in your church and community could do better to make them more employable. Writing interview and application tips for example! No Technology - No Problem! For those without access to technology, there is the use of facilities in most libraries. Where I live, the libraries run courses for those wanting to know more about being online! Whatever the person's interest is, it can be put online! Or how about this! Passing on older technology for people to use! We all upgrade at some point, so why not give on the obsolete technology to those who maybe able to use it! And even help them to use it! My passion, as you may have guessed, is to help people develop themselves and use New Media to do it. Many churches have many talented people able to do many things. Yet it seems, at least in my limited scope, that in most churches it's the few that does the most. After all, there are only a limited number of people who can prepare leading a service or deliver a bible talk. But these two things at least in part, for example, can be done within digital space using New Media. I do that for my site using Wednesday Worship and Friday prayers. Those are examples of what people can do as part of a New Media training programme within a church. Get people to pray for those you interact with using New Media! Get those people to pray for YOU as you use and develop New Media. Get beside people and get them using New Media! Have regular New Media Activity Days! Now, you may well be here representing a large church! Go for it - you have the numbers! What is stopping you? Whatever church you represent, here is a bit of a radical idea. How about getting churches to work together in some way as a New Media expression within your local community? Use your blogs and other New Media to reach out into your local communities. Be willing to participate in New Media activities of your community. Large numbers of local communities are represented on Facebook. Instead of starting a new page there, be willing contributors there! Now... Here is where the rubber hits the road! Let's get practical! Are there any examples from your own churches? We may as well help each other out! Let's brainstorm together of how we can include those ordinarily excluded! Let's go tickle!! Let's be determined to include as many people as we can in our social media endeavours! Use New Media: Blogs, Video and Audio, Mobile Apps, Facebook and Twitter. Use your local community New Media resources to reach out into your local community. Using wisdom, get people to pray for those you interact with using New Media! 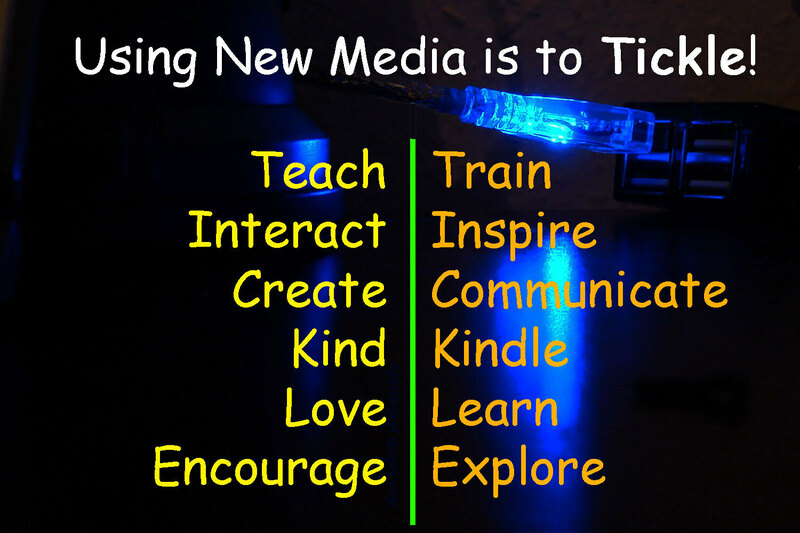 Let's go Tickle with New Media!